Our vision is to bring an integrated resource network to our clients while utilizing collaborative teamwork. In the world of medicine, patients have a group of doctors such as surgeons, cardiologists, nutritionists, radiologists, nurses and lab technicians assembled so they can enjoy better health. We think about our client’s financial well-being in much the same way as physicians consider their patients physical well-being. That is why our clients have access to our network of resources, alliances and professionals to help reduce the mental burden and stress of dealing with financial decisions. Comprehensive advice does not, by definition, come through one person or firm designated to structure and implement all aspects of a financial plan. 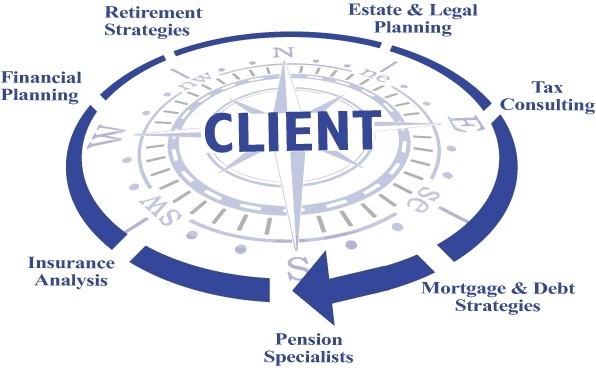 Depending on our client’s needs, we may incorporate the knowledge and experience of other quality professionals such as estate planning attorneys, tax accountants, insurance representatives or mortgage counselors. Successfully bringing together and leveraging knowledge in all areas allows us to provide comprehensive and integrated financial services to our clients.